Home » Will The Dragic Brothers Be Playing In The NBA? Will The Dragic Brothers Be Playing In The NBA? 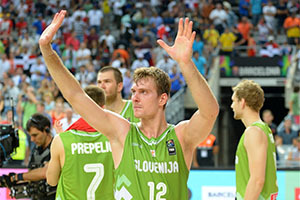 With Slovenia ranking 7th in the 2014 FIBA World Cup, there has been a great deal of interest in the team and a lot of attention has been showered on the Dragic brothers. Yes, the Gasol brothers of Spain may have been the key siblings for fans at the World Cup but with Spain’s shock loss to France in the quarter finals, the attention has swung back to some of the other brothers. 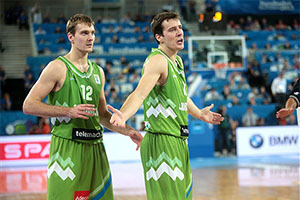 Goran and Zoran played a strong role in helping Slovenia obtain a 5-2 record and it looks as though the Phoenix Suns are in the hunt for to pair these brothers. This is a NBA franchise that understands the benefit of family because they already employ the Morris twins. Adding Zoran to their roster would be a great way to enhance the performances of his brother Goran but it is not as if the Suns are the only team that are keen on bringing the younger brother to America. The 25 year old player signed a two year extension to his deal with Unicaja Malaga in Spain in June but there is nothing to prevent him from escaping to a major league. In fact, the new contract contains an escape clause which says he can move to the NBA as long as he moves before the Spanish season gets underway. With the new Spanish league season starting in October, the clock is ticking but a deal could be done if a club really wants to get a hold of the player soon. It is also believed that the club would be entitled to a larger buyout fee if the player moves now as opposed to waiting to the summer of next year. The reported buyout figure is around $1m, so there is a sum of money involved with this deal but it may be a sum of money that an NBA team is willing to pay to get a hold of the player. The player performed for the Houston Rockets in the summer league of 2012 but this represents an even bigger opportunity to make it to the NBA. He had a strong World Cup, coming in as the second highest scorer for Slovenia and he is regarded as being a scoring guard. One of the things that Zoran will bring to any team that signs him is energy, which is definitely something that plenty of teams are looking out for. The fact that this energy comes with the required talent for the NBA makes it all the better, so it is really a matter of if and not when a bid comes in. Whether the price tag for this summer is too rich for NBA clubs remains to be seen but it is likely that there will be at least one team that is left kicking their heels and feeling as though they missed out by not making an early move for the player. Sometimes you need to move quickly, and this can often make the difference. One thing that may swing the Suns into action is the fact that they know they will be sitting around the table with Goran next summer, negotiating his terms. Having his brother at the same club may help to convince the player to stay, even if it is likely he will be offered plenty more money elsewhere if he maintains his form in the upcoming season. Goran Dragic is going to be a player in high demand in the summer of 2015 and the Suns may think their best chance of holding on to him for a while longer will rest on getting his brother involved with the club as soon as they possibly can.